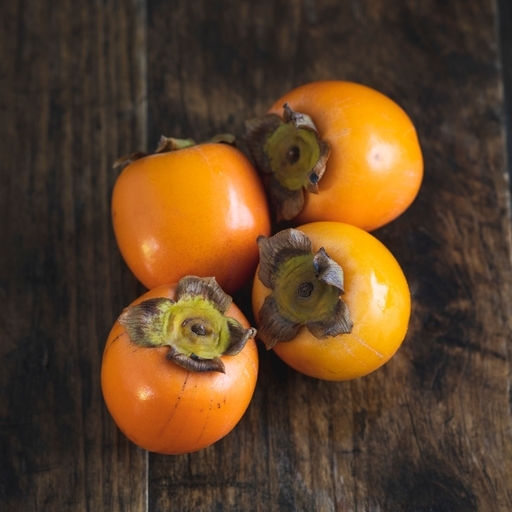 Organic persimmon fruit (or kaki fruit) have sweet, fragrant, orange flesh, similar to ripe nectarines in texture. Ours are grown in the south of Spain by Joaquin Perez, who has been growing flavoursome organic fruit for more than 10 years. The season is short, from mid-October to early December – a sweet mouthful of sunshine just as winter settles in to stay. Persimmon fruit are best eaten fresh, while they’re still fairly firm. There’s no need to peel – you can eat the skin. As well as eating them as they are, or in fruity desserts, we love them in savoury salads. A plateful of peppery mixed leaves, crumbled Stilton, toasted walnuts and sweet slices of persimmon makes a piquant treat. They’ll last about a week at room temperature, or longer in the fridge. Fresh from the farm, so please give them a wash before eating.